The latest version of Visual Studio, i.e. Visual Studio 2019 is committed towards faster execution, more productive for developers to perform their tasks; be it be refactoring, debugging and/or faster build process. It gives more focus on real time collaborations between team members using the capabilities like Live Share. Visual Studio 2019 (RTM and Preview) can be installed side-by-side with Visual Studio 2017 and will not require any major upgrade of the Operating System. To download the latest version of Visual Studio 2019, continue reading. 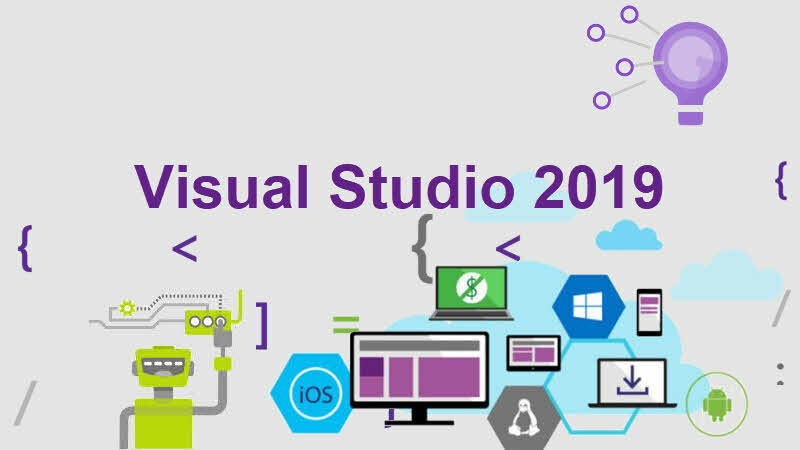 Microsoft released Visual Studio 2019 on 2nd April 2019, by organizing an online launch event. How to download Visual Studio 2019 (RTM)? How to download Visual Studio 2019 Offline Installer (ISO/DVD image)? Like Visual Studio 2017, Microsoft didn't release any offline installer (ISO/DVD image) of Visual Studio 2019 due to its size and various workloads. In most of the cases we don't need all the workloads that it downloads. So, it is a generic requirement to customize and select the one that we really need to save your internet bandwidth. If you really need the Visual Studio 2019 offline installer, you can use the --layout option to select the individual workload and download the required package(s) which you can use to install the IDE on multiple systems having no/limited internet connectivity. How to download Visual Studio 2019 Preview builds? What are the new features/enhancements planned for Visual Studio 2019? Quickly open code you recently worked on or start from one of the most commonly used flows like clone, open, or new project. Create new projects with an improved search experience and filters using the new list of most popular templates. Updated menu and title bar to increase space for code. Configure specific projects that load when a solution is opened. Checkout and review a pull request inside the IDE. Visual health status icon in the document scrollbar to indicate the presence of and provide quick navigation to issues, warnings, and errors in current document. One-click code cleanup command for documents, projects and solutions. New extensibility templates for creating Async Tool Windows. VSIX Manifest attribute to mark an extension as "Preview". VSIX Project Templates use to declare NuGet dependencies. Reduced Xamarin installation payload size. New in-product acquisition flow for Android emulator. Xamarin.Android Designer improvements with support for sample data. Support for find all references in Razor (.cshtml) files. Use Visual Studio with improved clarity across monitors with varying DPIs. Move some services to the background so solutions load faster. Visual Studio tooling (e.g. XAML and WinForms Designers, app publishing tools) for WinForms and WPF development with .NET Core 3. Xamarin.Forms 4.0 templates and tooling support. Xamarin.Android Designer improvements with initial support for constraint layouts. Enhanced Fast Deployment for Xamarin.Android. Updated Test Explorer that provides better performance for large numbers of tests, and enhanced grouping and sorting capabilities. Full featured debugging, interactive window, and IntelliSense experience when using Open Folder with Python. Debugging Python Flask and Django apps with auto-reload enabled. Ability to add SQL Azure databases, Storage Accounts, Application Insights, and Key Vaults to existing Azure App Service instances from the publish summary page. Support for running .NET Unit Tests against projects that target multiple .NET frameworks (e.g. .NET Framework and .NET Core). Basic x:bind support for XAML edit and continue.